One down, two to go! I finished the pin cushion part of the sewing accessory trio. I found some red, black, and white pins to use for the photo. I usually use fine white glass head pins when I sew. It will be nice having a stitch reference close by. I wish I would have thought of stitching the machine decorative stitches onto sewing accessories years ago. This entry was posted on Sunday, August 9th, 2009 at 3:00 am and is filed under Sewing. Tagged: Sewing. You can feed this entry. You can leave a response, or trackback from your own site. Love it. It is really cool to see what you did with the fabric you created from your stitch options on the machine! Fabulous! What a good idea! I love your color combo & what a great inspiration to keep next to the machine. I am lucky enough to have several stitch options on my sewing machine, but I have never used them, other than to test a few right after I bought it. 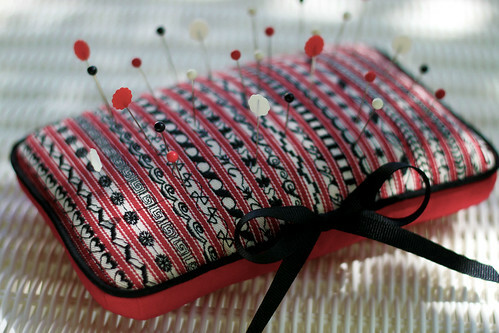 Your pincushion is chic, handy and a great reminder of what your machine could be doing to help you embellish your world! I love what you did with your stitch sample! How clever and how cute!